Just a quick recap on this project. We were challenged by the adverse weather conditions from start to finish on this project. We were supposedly in the middle of a drought? There was a hosepipe ban in operation for much of the country, yet rain delayed us no end on this job and it was one of those rare occasions when we were beat by the weather and had to do a temporary makeover to meet the deadline. We didn't really like having to leave the garden unfinished, but it was just too wet. We couldn't even lay the turf and instead had to lay sand to not only make the garden look better but also to try and soak up some of the excess water! As you can see from the pictures both above and below the garden was completed once the weather had dried up a bit and now the garden is looking amazing. The plants look well established and very healthy, who would have guessed it was the same muddy patch that caused us so many problems all those months ago! 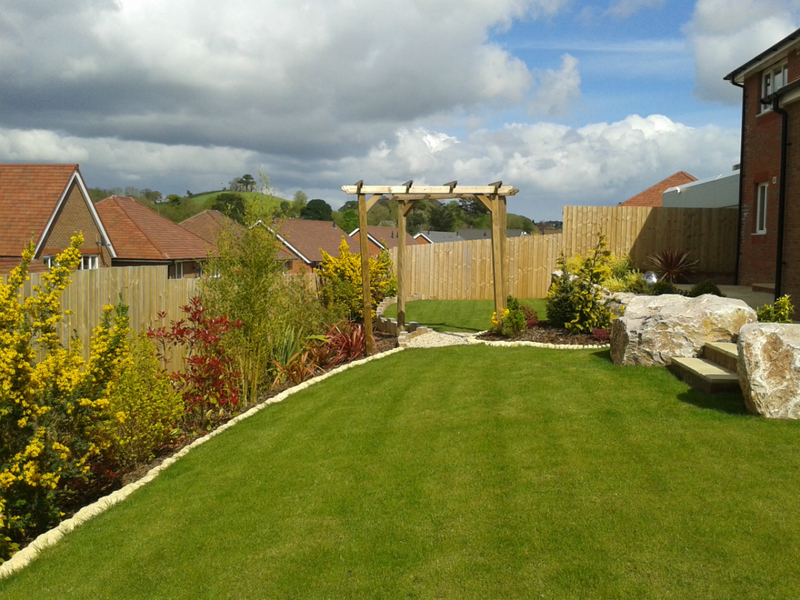 All the features from the strategically placed rocks to the edgings created from railway sleepers all add to make this a very successful and interesting garden. I have had a problem with drainage, not this summer though it has been so dry. I followed your tips on digging in extra sand and gravel to help last year and it certainly made a difference. This garden looks amazing. After looking through your site I think this is my favorite although it was hard to choose. Great looking site. Presume you did a bunch of work to dry the ground up to help with water logging before laying the turves and planting?